MicroRNAs expression has been extensively studied in hepatocellular carcinoma but little is known regarding the relationship, if any, with inflammation, production of reactive oxygen species (ROS), host’s repair mechanisms and cell immortalization. This study aimed at assessing the extent of oxidative DNA damage (8-hydroxydeoxyguanosine - 8-OHdG) in different phases of the carcinogenetic process, in relation to DNA repair gene polymorphism, telomeric dysfunction and to the expression of several microRNAs, non-coding genes involved in post-transcriptional regulation, cell proliferation, differentiation and death. Tissue samples obtained either at surgery, [neoplastic (HCC) and adjacent non-cancerous cirrhotic tissues (NCCT)] at percutaneous or laparoscopic biopsy (patients with HCV or HBV-related hepatitis or patients undergoing cholecystectomy) were analysed for 8-OHdG (HPLC-ED), OGG1 (a DNA repair gene) polymorphism (PCR-RFLP), telomerase activity, telomere length (T/S, by RT-PCR), Taqman microRNA assay and Bad/Bax mRNA (RT-PCR). Fifty-eight samples from 29 HCC patients (obtained in both neoplastic and peritumoral tissues), 22 from chronic hepatitis (CH) and 10 controls (cholecystectomy patients - CON) were examined. 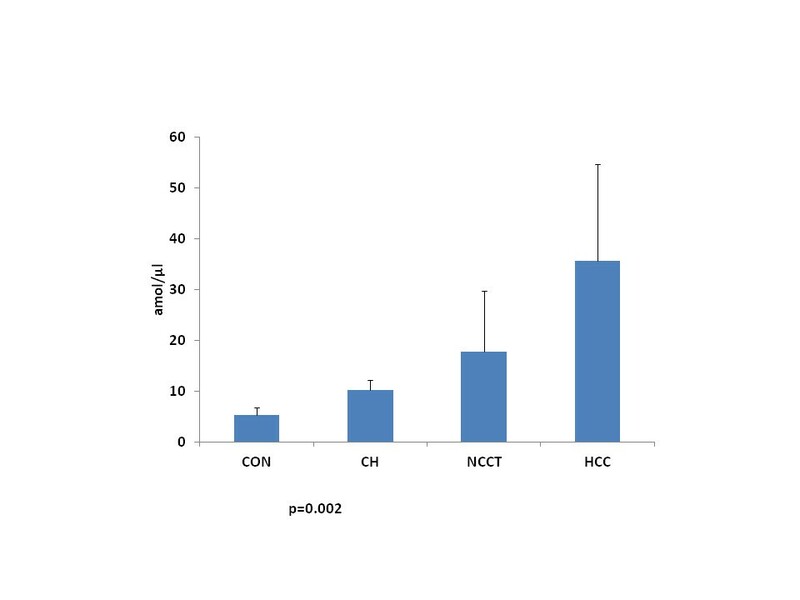 Eight-OHdG levels were significantly higher in HCC and NCCT than in CH and CON (p=0.001). Telomerase activity was significantly higher in HCC than in the remaining subgroups (p=0.002); conversely T/S was significantly lower in HCC (p=0.05). MiR-199a-b, -195, -122, -92a and −145 were down-regulated in the majority of HCCs while miR-222 was up-regulated. A positive correlation was observed among 8-OHdG levels, disease stage, telomerase activity, OGG1 polymorphisms and ALT/GGT levels. In HCC, miR-92 expression correlated positively with telomerase activity, 8-OHdG levels and Bad/Bax mRNA. The above findings confirm the accumulation, in the progression of chronic liver damage to HCC, of a ROS-mediated oxidative DNA damage, and suggest that this correlates with induction of telomerase activity and, as a novel finding, with over-expression of miR-92, a microRNA that plays a role in both the apoptotic process and in cellular proliferation pathways. Sound data suggest that reactive oxygen species (ROS) play a pathogenic role in carcinogenesis by inducing oxidative DNA damage, modulating gene expression, altering different signaling pathways and leading to a deregulation of cell proliferation and apoptosis [1–4]. ROS-induced DNA oxidation leads to a multitude of modifications to DNA bases, with 8-hydroxydeoxyguanosine (8-OHdG) representing the most frequent one. Eight-OHdG, a guanine adduct used as an index of DNA oxidative damage, induces a point mutation in the daughter DNA strands, accumulates in cell DNA and causes mispairing, thus demonstrating its mutagenic and potentially carcinogenic role . During virus-related liver disease, both in humans and experimental models, an increased production of ROS has been documented, with a strong link between HCV core protein or HBV X protein and an oxidative “burst” [6, 7]. These early events are followed in the progression of the disease by a build-up of genomic oxidative damage in patients with chronic hepatitis and cirrhosis, as documented in our own and other authors’ findings [8–11]. Several DNA repair mechanisms have specifically evolved and oxidized bases are repaired by a highly conserved base excision repair pathway, initiated by excision of the damaged base by glycosylases and by DNA strand cleavage. Four major DNA glycosylase, OGG1, NTH1, NEIL1 and NEIL2 have been characterized in human cells . The OGG1 gene encodes for a DNA glycosilase/AP lyase which removes the oxidised DNA bases. It is located on chromosome 3p26.2 and a CG polymorphism at position 1245 exon 7 of the gene [with substitution of cysteine for serine at codon 326 (Ser326Cys)] has been described, that is associated with a significantly lower DNA repair activity by the coded enzyme . Amongst the many potential targets of oxidative damage are microRNAs (miRNAs) . miRNAs are a family of non-coding genes, involved in post-transcriptional gene regulation, in cell proliferation, differentiation, cell death and carcinogenesis, that have been reported to play an important role in chronic liver damage progression and hepatocellular carcinoma (HCC) development . A list of miRNAs differentially expressed in HCC compared to non-cancerous liver has been indeed described , among which the liver specific miRNA, miR-122, often under-expressed in hepatic tumours, which also interacts with the 5′ noncoding region of HCV genome [17, 18]. Several others miRNAs are involved in cell cycle control; some of these, such as the miR-17-92 cluster, miR-21, miR-221/miR-222, miR-224 and miR-146a, are up-regulated in HCC, others, including miR-125b, miR-1, miR-195, miR-223, miR-101 and miR-145, down-regulated [18, 19]. These miRNAs may inhibit apoptosis, facilitate invasion and metastasis, act as either tumor suppressors or oncogenes  and have been associated with cell differentiation, self-renewal and tumor initiation in vivo, as in the case of the miR-181 family, overexpressed in hepatic cancer stem cells . miRNAs, as oxidative DNA damage, are also involved in the regulation of telomerase activity , which is up-regulated in mutated cells activity . Telomeric DNA indeed is particularly rich in guanine residues and, under ROS attack, is highly prone to 8-OHdG formation . The resulting telomere shortening, with chromosome instability, involves the first phases of carcinogenesis while tumor progression is linked to a reactivation of telomerase activity, with telomere elongation and cell immortalization [24, 25]. investigate the expression of a panel of miRNAs with possible direct or indirect interference on cellular oncogenes and tumor suppressors justifying their involvement in the pathogenesis of HCC, in relation to oxidative DNA damage, telomerase activity and factors involving in apoptotic mechanisms, including Bad and Bax . This study was carried out in tissue samples of patients with either HCC undergoing surgical resection or chronic virus-related liver damage undergoing US-guided liver biopsy and, as control group, in patients undergoing cholecystectomy. finally, ten patients undergoing cholecystectomy were submitted, during laparoscopy, to liver biopsy with the same modalities as above (6 females and 4 males, mean age 56 (±7) (CON). In each patient anti-HCV antibodies were looked for using a second-generation ELISA and all positive sera were confirmed by RIBA II assay. In all patients, anti-HCV sera positivity was confirmed by positive HCV-RNA levels determination using the Amplicor HCV test (Amplicor PCR Diagnostic, Hoffman-La Roche, Basel Switzerland). A standardized genotyping assay (Inno-Lipa HCV III, Innogenetics, Gent, Belgium) was used. The HBV group consisted of individuals who were HBsAg, anti-HBe, and HBV-DNA positive at PCR. HBV serum markers were tested by radioimmunoassay (RIA) (Abbott, Chicago, IL, USA), while HBV-DNA levels were tested using a commercially-available fluid phase hybridization assay (Abbott, Chicago, IL, USA). After obtaining informed consent, the patients provided full information relative to their drinking and smoking habits and completed a food frequency questionnaire with particular attention to their intake of vitamins. Patients with concurrent diseases or those taking medications capable of interfering with free radical production, such as non-steroidal anti-inflammatory drugs (NSAIDs) or anti-oxidants (vitamin C), were excluded from the study. The study that was approved by the Ethic Committee of Padua Hospital. Genomic DNA extraction from surgical liver samples and biopsies was made on portions of tissues immediately snap-frozen in liquid nitrogen and stored at - 80°C until use. For DNA extraction we used a Wizard Genomic DNA Purification Kit (Promega Italia, Milano, Italy) according to the protocol provided. The liver tissues (approximately 10 mg) were homogenized with pestle in a solution of EDTA 0.5 M pH 8, Nuclei Lysis Solution and Proteinase K (20mg/ml). This assay was performed with a portion of the liver material (both surgical and biotic samples), and consisted of 3 steps: (i) genomic DNA extraction using a Wizard Genomic DNA Purification Kit (Promega Italia, Milano, Italy); (ii) nuclease P1 and alkaline phosphatase hydrolysis of DNA; (iii) 8-OHdG determination using HPLC-ED, which is a highly sensitive method with a detection limit of ~2 adducts per 105 deoxyguanosine (dG). Following nuclease P1 and alkaline phosphatase hydrolysis, samples were filtered through 0.22-mm nylon filters (Scientific Resources, Alfatech, Genova, Italy), and 20 μL DNA per sample was injected in the HPLC (Alliance 2695, Waters, Milano). Eight-OHdG and normal deoxynucleosides were separated in a 3-mm Supelcosil LC-18-DB analytical column (7.5 cm × 4.6 mm, Supelco, Bellefonte, PA) equipped with a 5-mm SupelguardTM LC-18-DB guard column cartridge. The solvent system consisted of an isocratic mixture of 90% of 50 mM potassium phosphate, pH 5.5, and 10% methanol at a 1 ml/min flow rate. The 8-OHdG was detected using an electrochemical detector (ESA Coulochem II 5200 A, Bedford, MA) equipped with a high-sensitivity analytical cell, model 5011, with the oxidation potentials of electrodes 1 and 2 adjusted to 0.15 and 0.35 V, respectively. The levels of 8-OHdG were referred to the amount of dG detected in the same sample by UV absorbency at 254 nm. The amount of DNA was determined from a calibration curve vs. known amounts of calf thymus DNA. The 8-OHdG levels were expressed as the number of 8-OHdG adducts per 105 dG. An 8-OHdG standard (Sigma-Aldrich, St. Louis, MO, USA), prepared immediately before the assay, was injected before any set of samples. The coefficient of variation was <10%; the amount of DNA required for the assay was 100 μg. Samples with lower amounts of DNA were rejected, since the risk of methodological error is only acceptable above this cut-off. Cellular DNA isolated from tissue samples was analyzed by PCR to study the C:G transversion at nucleotide 1245 of the OGG1 gene. An aliquot of 100 ng of genomic DNA was added to a 25 μl PCR mixture and PCR was performed using the primers described by Kohno et al. , 5′-AGGGGAAGGTGCTTGGGGAA--3′ as the forward primer and 5′ –ACTGTCACTAGTCTCACCAG - 3′as the reverse primer. The thermoprofile consisted of 30 cycles of denaturation at 94°C for 15 sec, annealing at 58°C for 15 sec and extension at 72°C for 40 sec, preceded by an initial denaturation step at 94°C for 2 min followed by a terminal extension at 72°C for 5 min. The 1245 C:G transversion was identified using PCR-RFLP. Briefly, 10 μl of the 200-bp PCR product was digested with Fnu4HI. The presence of a C:G transversion creates a Fnu4HI recognition site, which leads to digestion of the 200-bp PCR product into 2 fragments of 100 bp. Heterozygous subjects exhibit 2 fragments (200 and 100 bp), and a homozygous C:G transversion results in the appearance of a single fragment of 100 bp. Fnu4HI digests of PCR amplification products were observed by electrophoresis on 3% agarose gels after ethidium bromide staining. Liver samples were lysed in 200 μl of CHAPS buffer containing Protease Inhibitor Cocktail (Sigma-Aldrich, St. Louis, MO, USA) and incubated at 4°C for 30 min. The lysate was centrifuged at 14000 rpm for 45 min at 4°C and the supernatant was collected −80°C. The protein concentration was measured using RCDC Protein Assay (Bio-Rad, Milano, Italy). Each hepatic sample was assayed for telomerase activity, starting from protein extracts of the liver tissue stored at −80°C, by an ABI 7900 Sequence Detection System (Applied Biosystems, Foster City, CA, USA). The total volume of the reaction mixture was 25 μl in SYBR Green PCR Master Mix (Applied Biosystems, Foster City, CA, USA) contained DNA polymerase Ampli-Taq Gold, dNTPs and dUTP, 1X SYBR Green buffer, 0.2 μg of T4 gene protein, primers TS (5′-AATCCGTCGAGCAGAGTT-3′) 0.6 μM, ACX [5′-GCGCGG(CTTACC)3CTAACC-3′] 0.4 μM and 1 μg/μl of protein extract. The PCR was performed in a 96-well micro titer plate and the reaction mixture was first incubated at 25°C for 20 min to allow the telomerase in the protein extract to elongate the TS primer by adding TTAGGG repeat sequences. PCR then started at 95°C for 10 min, followed by a 40-cycle amplification at 95°C 20 s and 60°C for 30 s. All samples were assayed in triplicate to test the reproducibility of the RTQ-TRAP assay, and in each assay also a protein extract of a cell line (PLC/PRF/5) as positive control and water as negative control were evaluated. Following amplification, a dissociation curve was performed in order to confirm the specificity of the reaction. Fluorescence signals and dissociation curves were collected and analyzed by ABI 7900 SDS 2.3 software so telomerase activity in cells line and samples was calculated based on the threshold cycle (Ct). Telomerase activity in cells line and samples was extrapolated using a standard curve prepared with serial dilutions of Telomerase Control Oligo Standard (amol/μl) containing telomeric repeats (TAAGGG). Telomerase activity was expressed as percentage compared to that in PLC/PRF/5 cells. (Tel-1:5′-GGTTTTTGAGGGTGAGGGTGAGGGTGAGGGTGAGGGT-3′, Tel-2: 5′- TCCCGACTATCCCTATCCCTATCCCTATCCCTATCCCTA-3′) and the other for 36B4, encoding acidic ribosomal phosphoprotein P0 used as the single copy gene (36B4u: 5′-CAGCAAGTGGGAAGGTGTAATCC-3′, 36b4d: 5′-CCCATTCTATCATCAACGGGTACAA-3′). Each 25 μl PCR reaction included 40 ng of DNA, SYBR Green Master Mix (Applied Biosystems, Foster City, CA, USA) and primers at final concentrations 270 nM Tel-1 and 900 nM Tel-2 or 300 nM 36B4u and 500 nM 36B4d, respectively. PCR amplification was performed in a ABI PRISM 7900 (Applied Biosystems, Foster City, CA, USA). In each plate, a standard curve was produced ranging from 4 to 80 ng of human reference DNA (Applied Biosystems, Foster City, CA, USA). The thermal cycling profile for the telomere amplification was 95°C for 10 min, followed by 30 cycles of 95°C for 5 s, 56°C for 10 s and 72°C for 60 s or 30 cycles of 95°C for 5 s, 58°C for 10 s and 72°C for 40 s. Following amplification, a dissociation curve was performed in order to confirm the specificity of the reaction. All samples were assayed in triplicate to test the reproducibility and in each assay was evaluated a negative control. Fluorescence signals and dissociation curves were analyzed by ABI 7900 SDS 2.3 software. Telomeres/single copy gene (T/S) ratio for each sample were obtained by dividing the mean amount of telomeres by the mean amount of 36B4 gene. We started from 0.1g of frozen tissue for each sample and RNA extraction was performed through mirVana miRNA isolation kit (Ambion, Austin, TX, USA), a method which combines phenol-chloroform and fiber-glass columns to obtain total RNA enriched in miRNAs. RNA was eluted in RNAse-free water and stored at −80°C; concentration and quality were checked with Nanodrop (Thermo Scientific, Canada, USA). The expression of a selected panel of miRNAs was then evaluated by mean of RT-PCR, using TaqMan microRNA assay (Applied Biosystems, Foster City, CA, USA). 10ng of RNA were reverse translated for each sample using looped primers specific for each miRNA and the obtained cDNA was assayed with real-time PCR with miRNA specific primers and TaqMan® probes. Data obtained for each miRNA were normalized versus a control RNA (RNU6B) and the relative expression for coupled tumour and normal samples was expressed by ΔΔCT method. For the synthesis of complementary DNA (cDNA), 2 μg of RNA were reverse transcribed in a final volume of 40 μl in the presence of 1X PCR buffer, 1 mM each of dNTPs (dATP, dTTP, dCTP, dGTP), 1 U RNase inhibitor, 2.5 μM random hexamers, and 2.5 U of murine leukemia virus (Perkin Elmer, Foster City, CA, USA). The reverse transcription reaction was completed at 25°C for 10 min, 42°C for 15 min and 99°C for 5 min, in a Perkin Elmer GeneAmp PCR System 2400. The cDNA was stored at −20°C. Real-time PCR was conducted in an ABI 7900 Sequence Detection System (Applied Biosystems, Foster City, CA, USA) using SYBR Green I. The reaction was obtained on 96-well plates, in a 25 μL final volume containing 1X TaqMan buffer, 5.5 mmol of MgCl2, 200 μmol of nucleotides with dUTP, 0.25 U of AmpliTaq Gold Polymerase (SYBR Green Master Mix), 300 nM of each primer and 200 ng of cDNA template. Nucleotide sequences for the sense and antisense primers used for real-time PCR were: 5′-CTTTTGCTTCAGGGTTTCATCC-3′, 5′-TTGAGACACTCGCTCAGCTTCT-3′ for Bax [ENST00000356483], and the length of this amplicon was 119 bp; 5′- TCTATGCAAGTTTTGCCCTTTGTA-3′, 5′-GCCAGCCTGAATGAAATGA- 3′ for BI-1 [ENST00000267115], and the length of this amplicon was 84 bp; 5′-CCTGGCACCCAGCACAA- 3′, 5′-GCCGATCCACACGGAGTACT for β-actin [ENST00000158302], and the length of this amplicon was 70 bp. After one 2-min step at 50°C and a second step at 95°C for 10 min, samples underwent 45 cycles of 45 s at 94°C and then: 45 s at 60°C for Bax and β-actin; 45 s at 65°C for Bad. A final extension step was performed at 60°C for 10 min. The data obtained were initially examined for their distribution with the Kolmogorov-Smirnov test and then compared by either Anova One Way or Kruskal Wallis test. Correlation analysis were performed by either linear correlation analysis or Spearman Rank correlation analysis, as appropriate. The chi square test was used when indicated. A p value < 0.05 was considered as significant. The StatsDirect and PASW Statistics programs were used. The power analysis for the data evaluated with unpaired two sample Student t tests showed the all the comparison with controls, with an 80% power and a 5% α error, were based on numbers of patients large enough to allow comparison. 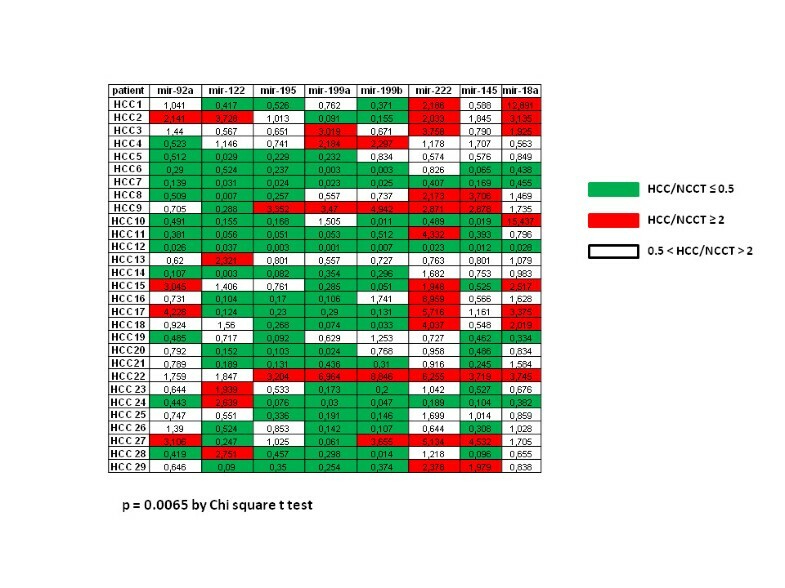 Oxidative DNA damage, as measured by the quantification of liver tissue 8-OHdG levels, was significantly higher in NCCT than in other groups (176±53 vs 142±33 HCC vs 76±7 CH vs 12±4 CON 8-OHdG/105 dG, p=0.01, Anova one-way), also if no significant difference emerged between HCC and NCCT (Figure 1). 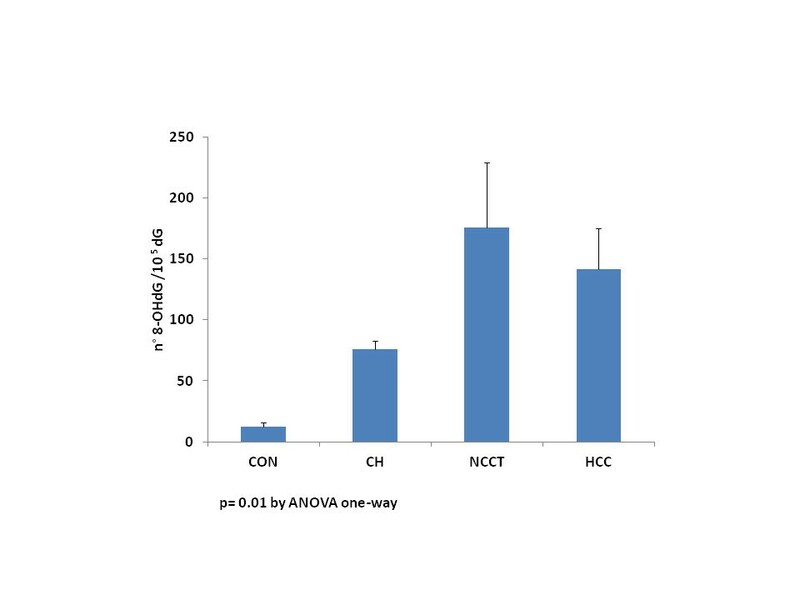 With the limitations given by the relatively small sample size, no difference was observed between virus-related and non virus-related HCC in both HCC and NCCT tissues (data not shown). 8-OHdG levels in liver tissues in different stages of the disease progression. 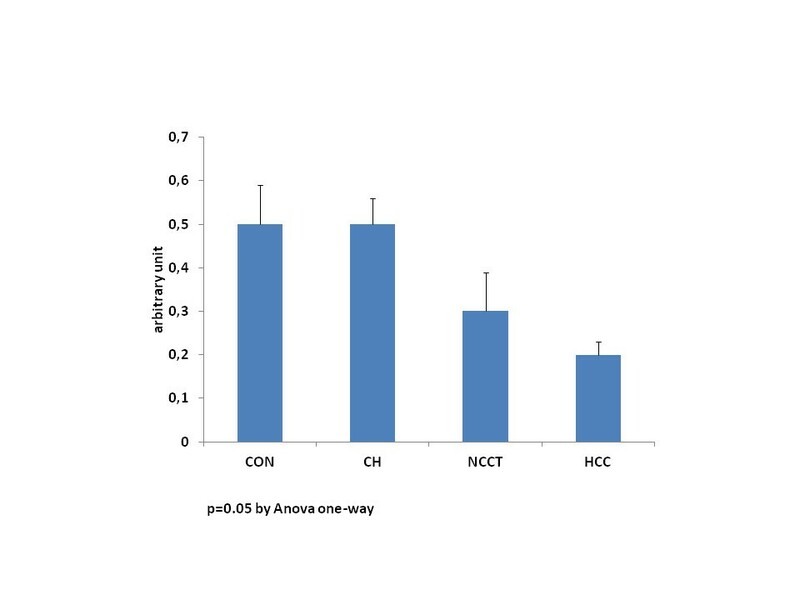 8-OHdG mean levels were significantly higher in NCCT than in other groups (CON, CH, HCC), p = 0.01 Anova one-way. CON Controls (10), CH HCV and HBV Positive Chronic Hepatites Tissues (22), NCCT Non-Cancerous Cirrhotic Tissues (29), HCC Neoplastic Tissues (29). With respect to OGG1 gene polymorphism, heterozygous CG or homozygous GG polymorphisms were detected more frequently in CON and CH patients than in HCC, even not significantly so (50% vs 54% vs 26%, p=n.s). As expected, an increased telomerase activity was detected in HCC (median 10.9 amol/μl, 0.6-77.9, 95% CI), versus all other patients groups (CON, CH and NCCT) (2.6 amol/μl, 1.7-8.6 95% CI; 6 amol/μl, 5.4-19 95% CI; 2.2 amol/μl, 0.1-22,1 95% CI respectively, p=0.002, Kruskal-Wallis) (Figure 2). Telomerase activity was higher than the upper 95% CI of CON in 34% of CH, 22% of NCCT and 53% of HCC. Telomerase activity detected in liver tissues in different stages of the disease. Mean/median levels of telomerase activity were higher in HCC patients’ group than other groups (p = 0.002 Kruskal-Wallis). CON controls (10), CH HCV- and HBV- Related Chronic Hepatitis Tissues (22), NCCT Non-Cancerous Cirrhotic Tissues (29), HCC Neoplastic Tissues (29). No correlation was found between telomerase activity and OGG1 polymorphisms. Conversely, telomere length significantly decreased from CON and CH to NCCT and HCC (0.5±0.09 vs 0.5±0.06 vs 0.3±0.09 vs 0.2±0.03, p=0.05 Anova one-way) (Figure 3). Telomeres’ length detected in liver tissues in different stages of the disease. Mean levels showed a significant reduction in the progression of disease to HCC (p = 0.05 Anova one-way). CON Controls (10), CH HCV and HBV Positive Chronic Hepatites Tissues (22), NCCT Non-Cancerous Cirrhotic Tissues (29), HCC Neoplastic Tissues (29). seven miRNAs showed a relevant deregulation in HCC tissues with respect to NCCT: miR-222 showed a high rate of over-expression (two-fold increase in 45% of the patients, significantly more frequently hyperexpressed than any other miRNAs, p=0.0065), while the levels of miR-92a, miR-122, miR-195, miR-199a, miR-199b and miR-145 showed a lower expression in HCC tissues (two-fold decrease ranging from 41% of patients for miR-92a up to 69% of patients for mir-199a). MiR-18a expression was not different in the two tissues (Figure 4). Results of the miRNAs expression in the samples of liver tissues. Each value represents the ratio of expression HCC/NCCT calculated using the ΔΔCt method (HCC/NCCT= 2- ΔΔCt ) on the average of the repetitions of each sample. The inclusion in the expression categories has the ratio 2 (or 0.5) as threshold with a margin of 5% confidence. MiR-222 was more frequently hyperexpressed than any other miRNAs (p=0.0065). NCCT Non-Cancerous Cirrhotic Tissues (29), HCC Neoplastic Tissues (29). This study was aimed at defining the interrelationships among oxidative damage, telomerase activity, telomeric dysfunction and miRNAs expression in the progression of chronic liver damage and HCC development. Our data confirm what ourselves and other authors already published on the relevance of oxidative DNA damage in the progression from chronic liver damage to HCC in virus-related liver damage, confirming the progressive accumulation of DNA damage that reaches a maximum in both the neoplastic and in the adjacent non-cancerous cirrhotic tissues. This last finding clearly indicates the presence of a “field defect” that most probably contributes to the multifocal and relapsing nature of HCC in cirrhosis . Our results demonstrated the lack of a specific significant association of OGG1 polymorphisms with HCC development. CG and/or GG polymorphisms, which are reportedly linked to a lower repair capacity in other cancers [30, 31], as also confirmed in our own experience , were less frequently detected in cirrhosis and HCC samples. There are several other repair enzymes potentially involved in repairing DNA oxidative damage  and the lack of association with OGG1 polymorphisms probably indicates that, in the liver, other repair mechanisms are more relevant than OGG1. On the other hand, a significant correlation was documented between OGG1 polymorphisms and 8-OHdG levels, overall, thus confirming that, when the polymorphism associated with lower repair capacity is present, oxidative DNA damage accumulates, irrespective of the phase of the disease and of the activity of other repair systems. Our findings also confirm that an increased telomerase activity is a feature of HCC, in agreement with the data reporting that a high percentage of HCC cases show an increased telomerase activity [34–36]. Using the data obtained in the control population, telomerase activity was increased in over 50% of the cases. Despite this increased activity, telomeres were significantly shorter in HCC than observed in chronic hepatitis. Other authors reported that HCC tissues are frequently characterized by an increased oxidative damage which contributes to the acceleration of telomere shortening and the activation of telomerase in cancer cells. Telomeres act as protective caps at the ends of chromosomes and telomere shortening promotes chromosomal instability. It is not therefore surprising that telomere shortening occurs during the course of chronic liver disease and in hepatocarcinogenesis. The data we obtained with respect to miRNAs in the study are largely in agreement with well established literature reports on miRNAs expression in HCC. In particular, miR-222 was found overexpressed in the neoplastic tissue, consistently with other findings on HCC, pancreatic and gastric cancer . Also the under expression we observed with respect to miR-199a, miR-199b, miR-195 and miR-122 in tumour samples supports what reported by many other groups in HCC [37, 38] as well as in other cancers [39–41]. MiR-92a, part of miR-17-92 cluster, was instead found under-expressed in nearly one half of the tumour samples investigated . This result is in contrast with what reported in several publications regarding an overexpression of the entire miR-17-92 cluster in most cancers. In many cases however the individual behaviour of miR-92a was not well defined in these papers [43, 44]. On the other hand, our data are in agreement with a number of studies which reported a decrease in miR-92a expression in association with a deletion in chromosome 13q that encodes for the miR-17-92 cluster [45, 46], a relatively frequent finding in cancer samples. the down regulation of miR-17-92 family may be advantageous for cancer development: as previously mentioned, loss-of-heterozygosis at miR-17-92 locus (13q31.3) has been observed in multiple tumour types (including HCC) ; moreover, the down regulation of another member of the cluster, miR-17, has been reported to contribute to breast cancer development through over expression of its target, the oncogene AIB1 . many of the miRNAs that have been reported to be up regulated in a variety of cancer cells, as miR-17-92, show a lower expression associated with in vitro stress conditions [49, 50]. For example, the induction of ROS by mean of oxidant agents has been shown to reduce the expression of a group of miRNAs, including members of this cluster: miR-17, miR-18a, miR-20a, miR-92a and the paralogs miR-106a and miR-20b . As shown by our results, miR-92 may also participate in the complex interplay of factors up or down-regulating apoptosis . Our data indicate the existence of a link between oxidative damage and miR-92 expression. In particular, this study demonstrates, for the first time and in vivo, that down-regulation of miR-92 significantly correlates with both the extent of oxidative DNA damage and telomerase activity in HCC. Additionally, miR-92 levels also correlated with Bad and Bax mRNA, involved in apoptotic mechanisms. Overall, our findings suggest that in chronic HCV-related liver damage, the persistently increased ROS production leads to accumulation of oxidative DNA damage, which is only partially repaired by OGG1 in association with other repair mechanisms. A deranged expression of several miRNAs is confirmed, one of which (miR-92) is apparently correlated with the extent of oxidative stress and with telomerase activation in HCC tissues. The study was supported in part by Ricerca Scientifica 2009 (cod: 60A07-9227/09), Padua University. An erratum to this article is available at http://0-dx.doi.org.brum.beds.ac.uk/10.1186/1471-2407-14-284. CR performed the majority of experiments and wrote the manuscript; PM, SA, LE, BM and KA performed the experiments; CU and ZG provided the surgical liver samples; MC and RM performed the histological analysis; FF designed the study and controlled the report. All authors read and approved the final manuscript.